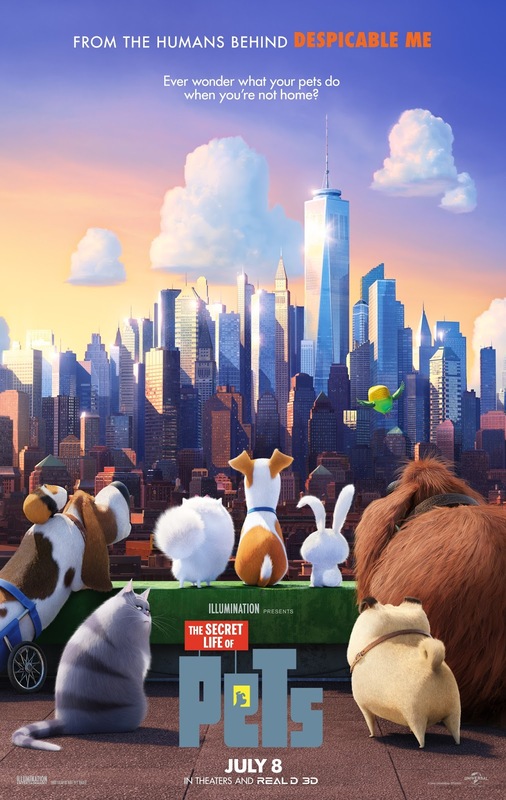 Comedy superstars Louis C.K., Eric Stonestreet and Kevin Hart make their animated feature-film debuts in The Secret Life of Pets, which co-stars Jenny Slate, Ellie Kemper, Lake Bell, Dana Carvey, Hannibal Buress, Bobby Moynihan, Steve Coogan and Albert Brooks. Illumination founder and CEO Chris Meledandri and his longtime collaborator Janet Healy produce the film directed by Chris Renaud (Despicable Me, Despicable Me 2), co-directed by Yarrow Cheney and written by Cinco Paul & Ken Daurio and Brian Lynch. Download the new PetMOJI app to create an emoji of your favorite furry friend! Currently available on iOS, the app features sticker packs and a custom keyboard. Customize your own PetMOJI avatar by selecting a dog or a cat, then choosing features for your pet: a body, a snout, eyes, ears, and a tail – plus patches, patterns, and colors. Available for iOS, Android coming soon. The trailer looks really cute. My daughter saw the commercial on TV and wants to see it. I am very excited to see this movie, it looks so cute! The trailer is adorable! I can't wait to see this movie! I'm an animal lover and all of the characters are just too cute! The movie looks really cute. I am excited to see it with my grandsons. My kids and I are very excited to see this movie! We giggle every time we see the previews! I think it looks like a cute movie. My daughter is super excited to see it. I think the trailer is adorable. It looks like it is going to be a lot of fun. We are looking forward to seeing this movie. Yes, I can't wait to see this film with my niece. The trailer looks funny! I think my nieces would love to go with me to the movie. The movie trailer is very cute. I can't wait to take my grandchildren to see this movie. I think we would all enjoy it. Thank you for the giveaway! This movie looks so adorable. I have always wanted to know what my dog does when I am gone. I want to see this movie. A must for me. I think the trailer is adorable. I am looking forward to seeing it. Since I am a cat lover I enjoyed the trailer. I am such a pet lover, especially dogs, so this movie looks super cute!! I loved the trailer. I think this movie looks really cute. I'm excited to see it with my 4 year old daughter. I think it looks really cute. I plan on taking my two grandsons to see this. They've been seeing the previews and are really excited. Oh this looks so cute! I cannot wait to take the family! Chloe looks so adorable and funny! I think everyone would love it! The trailer looks fun! My children and I would love to see the movie! I think it looks like a fun movie for the whole family. Chloe is too funny and cute, though all of the animals in the movie do. I would like to see this with my son. I love the trailer and so do my kids. We can't wait to see this movie. I think the trailer is very interesting. The characters are very cute and look like a handful! I am very excited to see this movie and would love to see it with my mom. We've been seeing the trailer in theaters for a while, and are very excited to see it! I think it looks adorable and hilarious. I think this movie will be a surprise hit! I think it looks like a really cute movie to watch with our girls. The trailer looks great. I really makes me want to take my daughter to see the movie. I think it looks like it will be a cute movie and can't wait to see it!! I am very excited to see this movie. Being a pet owner I find it hysterical and think I may have to place a hidden camera in the house to see what my pets actually do. The movie looks cute and funny. I'd like to see it with my nieces and nephew. This looks like a funny and fun movie to watch. The trailer is hilarious! We can't wait to see this one!! Too cute. Will see it. I always wondered what my pug does when she's alone in the house. I think the movie looks adorable. My kids are really excited to see it. Looking forward to seeing it. Looks funny. My kids and I are really excited to see this movie! I love the idea behind this movie. I always wonder what pets do when we arent there. It seems like we've been waiting forever to see this. We can't wait to watch it. Thank you! I think the trailer is very funny. I am excited to see the movie with my kids. I think the trailer is adorable and I'm excited to see it with my son. I love the trailer, I'm looking forward to seeing the movie with my son. very cute, I am sure my kids would love it. I think the trailer is cute. I am looking forward to seeing this with my children. I have seen the trailer a few times and I think this looks adorable! I have been pretty excited to see this. The trailer is so cute! My kids want to go see this movie - soon!! This movie looks hilarious and my daughter is dying to see it! This trailer is adorable.. anyone that has a kid and/or a pet should run out to see the movie. The trailer is adorable. It has been out for several months and I always laugh when I see it! We plan on going to see the movie this weekend or next weekend. It looks so cute and I know my husband and the kids are going to love it! I'm excited about this movie, we're going to go see it for my birthday. My hubby and I have quite a few cats and we always joke about stuff like this - what they did when we were gone etc. Looks great. Thanks for the chance! showed my 5 year old neice and she is asking to go - jumping up and down! i'd say thats excited! i think it the kind of kids movie i will enjoy too. I think this looks like an adorable movie to take my children to see. Yes, it looks adorable! I can't wait to see this with my oldest daughter. I am excited to see this with my family. It seems so cute and fun. I'm so excited to see it - I love Ellie Kemper! I'm a sucker for animal movies, so I like a lot of them. BUT, this one looks great! It looks so funny and intriguing and it doesn't bog people down with too many characters follow - just enough to keep track, and bring lots of laughs. I can't wait to see it! This looks super cute! I love pets and would enjoy this movie. It looks like such a cute movie. Our whole family loves pets so we would enjoy this movie. Love the trailer! I can't wait to see the movie! I am sure my cats will be making a cameo appearance! The trailer looks super cute! I am so excited to see it! This movie looks really funny! We are going to the drive in this weekend to watch it! I love the trailer and my sons are so excited to see it!!! Yes! very very excited to see this one. I love the trailer and will be taking my granddaughter to see this one. My daughter and I laugh every time the trailer comes on! Thanks so much for the chances to win. The trailer is awesome! I can't wait to see it. Funny! We have a cat so my daughter was asking if ours raid our fridge during the day. LOL. We both want to watch the movie! The trailer looks pretty funny. My daughter is super excited to see the movie! I'm excited to see it. It looks really cute. Looks like a great movie. I think it looks like it would be fun to see. It looks like a fun movie, and my girls are looking forward to seeing it. I like the trailer a lot, and it makes me even more ready to see it with my nephew. I thought the trailer was very interesting. I'm very excited to see it!